King Edward VIII (June 23, 1894 - May 28, 1972) was born at Richmond, Surrey, the eldest son of the Duke of York who later became King George V of the United Kingdom. Within the immediate family, he was always known by the last of his seven christian names: "Edward Albert Christian George Andrew Patrick David". He was created Prince of Wales in 1910, on his father's accession to the throne, and was officially invested with the title in a special ceremony at Caernarfon Castle in 1911. It was the first time since the middle ages that such an event had taken place in Wales, and it occurred at the instigation of the Welsh politician, David Lloyd George, who at that time held the position of Chancellor of the Exchequer in the Liberal government. When World War I broke out, Prince David was old enough for active service and was keen to participate. Although he was allowed to join the army, he was kept well away from any action that might have threatened his safety. After the war, his conduct began to give cause for concern to his ultra-conservative parents, particularly when he started a relationship with a series of married women, including Freda Dudley Ward, Lady Furness, then Wallis Simpson. Simpson had divorced her first husband many years before and was now married to Ernest Simpson. Mrs. Simpson and David became lovers while his official mistress, Lady Furness, was abroad. Following his father's death on January 20, 1936, he scandalised society by watching the proclamation of his own accession to the throne from a window, in the company of the still-married Mrs Simpson. Marriage to Mrs. Simpson was deemed impossible for the king, even after her second divorce was obtained, because he was head of the Church of England, which prohibited remarriage after divorce. Several alternative solutions were proposed, including a morganatic marriage, but Edward was adamant that he wished to marry Mrs. Simpson, and he eventually abdicated his throne on December 11, 1936. State papers released in 2003 revealed that, during the abdication crisis, as well as King Edward, Mrs. Simpson simultaneously had two other lovers, one a car salesman, the other the Duke of Leinster, close friend of the King. The abdication crisis caused a constitutional upheaval, and the throne passed to the king's younger brother, who became King George VI of the United Kingdom. 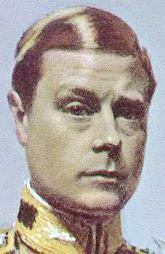 In 1937, the former king was created Duke of Windsor. Three months later, he married Mrs. Simpson. He was appointed Governor of the Bahamas, a post he held until after the war ended in 1945, when the couple retired to France, where they spent much of the remainder of their lives. In recent years, it has been suggested that the duke was a fascist sympathizer during World War II and was kept in the Bahamas to minimize his opportunities to act on those feelings. In later years, he was reunited with other members of the royal family on several occasions, but his wife was never accepted. He died in 1972 at Paris, and his body was returned to Britain for burial at Frogmore, near Windsor Castle. The Duchess of Windsor, on her death nearly two decades later, was buried alongside her husband in Frogmore.